I have a verizon galaxy note 3 32GB. my issue is that I noticed my storage capacity and my storage left do not match. let me explain, According to my storage section of the settings, it shows that I have 32gb of data. Then it shows me the usual items that are using up storage like apps, pictures, videos, cached and miscellaneous files, etc. 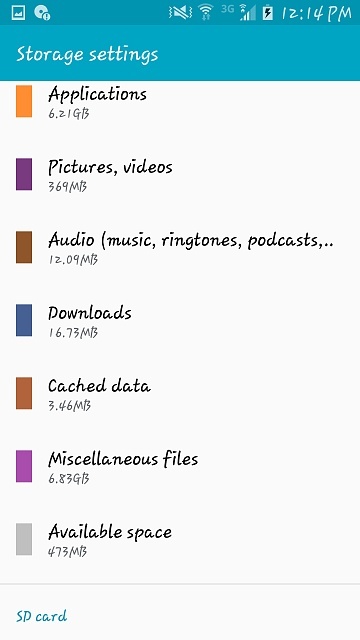 so here is the scoop, apps are taking up about 6.8GB, and miscellaneous files take up about another 6.8GB of memory including the "system memory" memory that is required for the phone, i get that. the rest of the files are mb worth of stuff. WHAT GIVES!!! Where is half the memory?? i'll upload pics for visuals. so anyways, this is really bugging me because i cannot, cannot figure out where half my memory went, so if anyone, anyone can help me i would appreciate it. That's odd... especially since the graph does show the 'right' amount of free space (over half of it is gray, see?). Just out of curiosity, have you tried copying a large file to your phone? Like a movie or something? 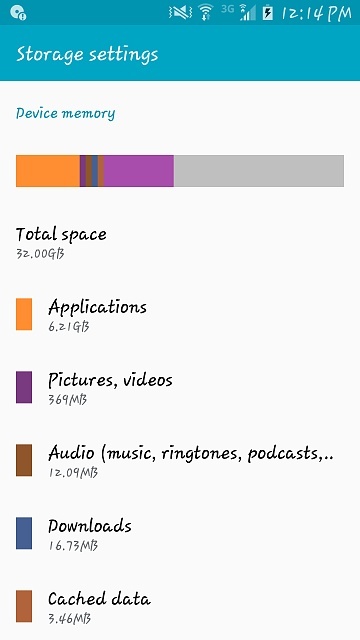 If you connect your phone to a PC and try to look at it's properties, does it give you the correct 'free space' information? I have not. I will try that and let you know what it comes out as. Okay, I plugged the phone into the computer and it's telling me the same thing. It's telling me that I have the same mb left of storage out of the 32gb of phone storage. Gold Note 5 on it's way?? How do I remove pdanet+ password from Galaxy S5?